Today, I’m super pleased to be on the stop for the blog tour Twisted by Steve Cavanagh, published by Orion Publishers. Having never read any of Steve Cavanagh’s previous novel, I was excited to get my teeth stuck into this one and boy was it worth it! This is one of those novels that you can’t just sum up in a few short sentences so I’m not even going to attempt too. What I loved about this book is the total unexpected twists and how the author manages to lull you into a false sense of security at the beginning, only to flip everything on its head again and again. It is one of those novels which you won’t be able to put down as the author asks so many questions – like how the hell?? This novel sure takes you on a rollercoaster ride of emotions and keeps you on the edge of your seat until the very end! Oh and that ending – breathtaking! This is a standalone novel, so even like me you haven’t managed to read any of he’s other novels yet it’s a great introduction into this author’s fabulous writing style and twisted mind! I don’t want to keep banging on about it as it’s really difficult to sum up without giving the game away. So just read it!! Would highly recommend for anyone who loves and amazingly twisty story which will keep you guessing – up until the very end! As always don’t forget to follow the other fab stops on this tour! Today I’m super excited to be hosting the next stop on Rachel Abbott’s The Shape of Lies blog tour, with clue number 3 in The Shape of Truth or Lies Game. Play along for your chance to win a signed copy of this fab book! This is Abbott’s ninth novel and it follows respectable mother, wife and head teacher, Anna Franklyn, who is driving to work when a voice on her favourite radio phone-in programme shatters every hope that she has escaped her dark past. The caller on ‘The One That Got Away’ claims to be her ex-lover, Scott, and in less than a week, he will expose her truth on air. But how is that possible when Scott is dead? To celebrate the publication of The Shape of Lies Rachel Abbott is playing a game of truth and lies. Play along, follow the blog tour to collect all the truths and you could be in with a chance of winning a signed copy of The Shape of Lies. Full T&Cs can be found here. The next round of The Shape of Truth or Lies continues over on [www.compulsivereaders.com] tomorrow. I live in a Victorian Fort in the Channel Islands. It housed 55 Germans during the 2nd World War and was also home to seven guns. I live in an apartment in a 16thcentury building in France which was used as the location for the prison in the 1975 film version of The Count of Monte Cristo. I live in a converted lighthouse in Cornwall, which is the inspiration for my second series of thrillers starring Sergeant Stephanie King. Remember to head to www.compulsivereaders.com tomorrow for the next stop of The Shape of Lies blog tour and the next game of The Shape of Truth or Lies. Rachel Abbott, born and raised in Manchester, founded her own interactive media company in the 1980s, before selling it and retiring in 2005. She then moved to Italy where she worked on the renovation of a 15th century Italian monastery, and it was here that, one day, she found herself snowed in and decided to begin writing for pleasure. This became her debut novel, Only The Innocent, which she went on to publish via Kindle Direct Publishing, topping their chart for 4 weeks. A true self-publishing pioneer, The Shape of Lies is Abbott’s ninth novel. She splits her time between Alderney in the Channel Islands and Italy. Don’t forget to follow the other fab stops on this tour! Today, I’m super excited to be a stop on the blog tour for The Silent Patient by Alex Michaelides, published by Orion. For my stop I have reviewed this fabulous book and want to say a thank you to Tracy Fenton for inviting me to be a part of this tour. This book just gripped me from the very beginning! Alice Berenson was a famous artist, one who hasn’t spoken in years – not since the night she shot her husband Gabriel in the face five times and became admitted to a high security hospital, The Grove. Theo Faber is a psychotherapist, someone who has been intrigued with her case since her crime became national news and he saw that painting. Theo believes he can cure Alicia where everyone else has failed. But is secretly obsessed? I absolutely loved this psychological thriller which had me hooked. One of the things I enjoyed is the strong characters. Throughout the story you hear snippets of Alicia’s voice through her diary entries but it does make you wonder do you really know whether it is the truth or not? Theo is Alicia’s psychotherapist who has recently join the team at The Grove and forces his way into the team treating Alicia, because he believes he can treat her where all others have failed. But this made me wonder – why is he so obsessed with her? The plot is a twisty mess of emotions which really plays on the reader, this is a slow burner but I thought this made this tale all the more compelling – as you delve deeper into Theo’s and Alice’s worlds, nothing is as simple it seems. I felt the author’s way of story telling was completely enthralling and lured me as the reader into a false sense of security which made the ending even better! This is was also very twisty, surprising and actually the ending just flipped everything around on it’s head – something which I wasn’t expecting, particularly from one of the characters but I can’t say anymore without spoiling it. I would just urge you to read it for yourself. If you love a discovering a new captivating voice, with a warped twisty mind, amazing characters and a dark story at it heart this is definitely the book for you! Alex Michaelides was born in Cyprus in 1977. He wrote the film The Devil You Know starring Rosamund Pike, and co-wrote The Brits are Coming. The Silent Patient is first novel, and was inspired by a post graduate course in psychotherapy, and working part-time at a secure psychiatric unit. To find out more about Alex Michaelides follow him on twitter@AlexMichaelides. 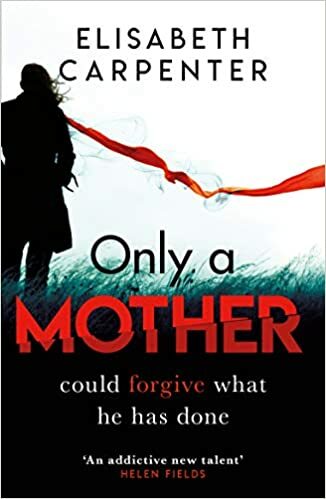 Today, I’m super excited to be featured on the next stop of the blog tour for Elisabeth Carpenter’s new book, Only A Mother, published by Orion Books. As part of the tour I have reviewed this fab book, but first up here’s a little about the novel. I mean just WOW! This tells the story of Erica, whose son Craig was convicted 17 years ago of the murder of a young girl. Erica has always believed Craig was innocent, dutifully visiting him every week he’s been in prison. But Craig has now made parole and arrives home someone completely different. But when another girl goes missing, Erica must make the hard choice and face up to what could have happened all those years ago – or who her son really is. This novel is told from the point of view of Erica, Luke a newspaper reporter and an unknown killer. What I loved about this novel is how the author could get under the skin of the characters and really brought them to life in this story. I liked the view point of Luke, an outsider who feels sorry for Erica but is determined to seek justice for the other missing girl Craig was never convicted for, as well as the new girl who suddenly vanishes. I literally could not put this book down – the complex relationship between a mother and child was really at the heart of the novel and made for addictive reading. The twists and turns in this plot also made for such a compelling read. This is a dark and creepy read, with a twisty plot and very disturbing but believable characters. Would highly recommend! To find out more about Elisabeth Carpenter follow her on Twitter @LibbyCPT. A massive thanks to Tracy Fenton and Alex Layt for allowing me to be a part of this blog tour. As always don’t forget to stop off at all the other amazing stops on this blog tour! Today, I’m super pleased to be closing the blog tour for Sarah Hilary’s new novel Come and Find Me, published by Headline. This is the fifth novel in the DI Marnie Rome series which sees Marnie Rome and Noah Jake faced with a new evil. A new evil which seems to come from an escaped prisoner, Michael Vokey, who’s sadistic infatuations is just the tip of the iceberg. The novel opens with such a vivid description it had me gripped – I couldn’t put it down until I had finished this novel. Again, we see DI Marnie Rome trying to understand and increasingly becoming more and more entangled in the web which is her foster brother’s sick mind, as she grapples with her parents murder. Whereas her partner, DS Noah Jake is also dealing with his own guilt regarding his brother which he just can’t shake. I really don’t want to give too much away as it will reveal too much of the twisty plot but what I can say is – it is yet another cracking read. I have always enjoyed this series with it’s strong characterisation, social commentary and compelling but twisty plots – and this one was no different. The author’s storytelling and descriptions of London really brings this novel and series to life, to the point you feel you are there right in the action. I also adore the characters of Marnie Rome and Noah Jake and their strong friendship which is at the heart of these books. This novel doesn’t shy away from hard hitting themes regarding over crowded prisons and the problems which the inmates are facing on a daily basis as well as the psychological aspects of crimes. This makes the social commentary, and the plot even more realistic. If you haven’t read any of Sarah Hilary’s books I would recommend starting from the very beginning. If you haven’t yet read this novel in the series – where have you been? I would highly recommend! Sarah Hilary’s debut, Someone Else’s Skin, won the Theakstons Crime Novel of the Year 2015 and was a World Book Night selection for 2016. The Observer’s Book of the Month (‘superbly disturbing’) and a Richard & Judy Book Club bestseller, it has been published worldwide. No Other Darkness, the second in the series was shortlisted for a Barry Award in the US. Her DI Marnie Rome series continued with Tastes Like Fear, and Quieter Than Killing. To find out more about Sarah Hilary follow her on Twitter @sarah_hilary. Come and Find Me is out now and can be purchased via Amazon here or Waterstones here. A massive thanks to Anne Cater and Headline for allowing me to be a part of this tour. Today, I’m super excited to be on the next stop for Jenny Blackhurst, The Night She Died blog tour, published by Headline. I must admit I haven’t quite finished this novel but what I have read has been cracking! I literally can’t put this down. The opening is one of the best I have ever read and my god it hasn’t let up! The prologue starts with Evie standing on a clifftop thinking about what she will do…. ”As the woman lets go of her veil and watches it flutter towards the cliff edge she steps forward and hurls herself into the darkness. A few moments ago they were just lovers, now they are witnesses”. This image has really stuck with me and now I am just dying to know why. What also has really gripped my attention is the introduction of Rebecca, Evie’s best friend, who although seems very upset and claims to have no idea what happened, knows exactly why she had jumped. So far, this is a tightly plotted, gripping story and I can’t wait to find out more! Sound intrigued? I would urge you to start reading asap! The Night She Died is out in Ebook on 6th September and in Paperback on 1st November, and can be ordered from Amazon here. As always don’t forget to check out all the other fab stops on this blog tour! Today, I’m super excited to be on the next stop for Cara Hunter’s In The Dark blog tour, published by Penguin Random House. Wow – what a fantastic instalment in the DI Fawley series! This is the second novel which sees DI Adam Fawley faced with a complex case where nothing is as it seems….how did the woman and child get there? How are they still alive? What happened to them? These were just some of the gripping questions I was dying to know! I thought this was such a twisty story which even led me up the wrong path before flipping it all on it’s head. One of the stand out things about this series is the characters – DI Fawley is such a interesting and believable protagonist and is not your most obvious hero. His relationships with the other members of the team also make for fascinating reading and had me invested even more into the story. I don’t want to say too much as it’ll spoil the story for you, but I loved the way the author switched between social media updates, media reports, formal police accounts and the main characters view points, which made it all the more thrilling! Sound intrigued? If you haven’t read any of the series yet I would urge you to start! In The Dark can be ordered from Amazon here.